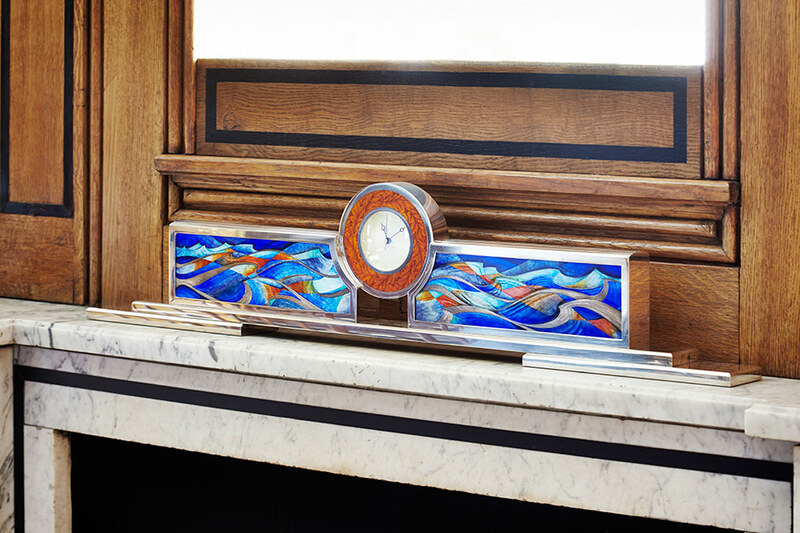 The enamel on this clock alludes to the United Kingdom as an island nation, with the oak leaves emblematic of the oak traditionally used to build British warships and the flanking enamel plaques representing the sea. John Andrews and Derek Styles, Designer British Silver from the Studios Established 1930-1985, Antique Collectors’ Club, Woodbridge, 2015, pp. 434-435, illustrated p. 435. Jane Short studied at the Central School of Art and Design where she was first introduced to enamels while training to be a jeweller. She went on to study for an MA at the Royal College of Art focusing on silversmithing and the further exploration of enamelling techniques. She established a workshop in 1979 and continues to produce commissions, teach and work with other silversmiths and jewellers. Jane was a founder member of the British Society of Enamellers. Along with the Silver Trust Her work can be found in the collections of the Goldsmiths’ Company, the Victoria and Albert Museum and the National Museum of Scotland to name but a few. Jane Short has work in many leading collections in United Kingdom. Jane Short is a Freeman of the Goldsmiths’ Company.